Meet Evie, a young woman who has fled with her uncle to the isolated New Zealand beach town of Maketu. Jim says he's hiding her to protect her, that she did something terrible back home in Melbourne. Something Evie can't remember. But Evie isn't her real name. And Jim isn't really her uncle. In a house that creaks against the wind, Evie pieces together the events that led her here. And as her memories return, she starts to wonder if Jim is really her saviour . . . or her captor. A compulsive, twist-filled debut that explores the fragility of memory, perfect for fans of Sharp Objects, Room and Top of the Lake. Evie and her Uncle Jim have moved to an isolated beach town in New Zealand - a far cry from their home in Melbourne. Jim tells Evie she did something terrible back home, that he's hiding her to protect her. But Evie can't remember anything about that night - she doesn't know if he's telling the truth. As fragments of her memory starts to return, she starts to wonder if Jim is really her saviour . . . or her captor. JP Pomare grew up on a horse-racing farm in small town New Zealand with his three older siblings and his father. He left for Melbourne where he developed his craft, entrenching himself in the Australian literary community. For almost two years he produced and hosted a podcast called On Writing, interviewing almost thirty local and international authors including Joyce Carol Oates, John Safran, Dorthe Nors, E Lockheart, Chris Wormersley, and Sofie Laguna. J P Pomare has been published in several journals and has also won, and been short- and longlisted for a number of prizes include the KYD Unpublished Manuscript Prize. 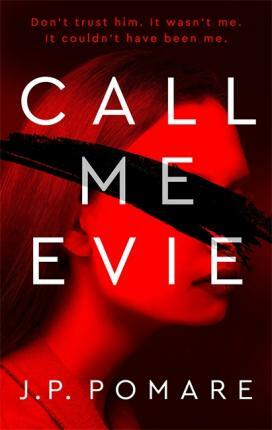 Call Me Evie is his first novel.